When an old blind man is mowed down by a runaway truck his corpse ends up on the mortuary table of Dr Siri, the elderly national coroner of the newly independent Laos. In the blind man’s pocket is an envelope containing a blank sheet of paper. Drawing on his love of Inspector Maigret, Dr Siri reveals an invisible coded message and with his friends cracks the code. What is revealed sends him to the south of the country where royalist sympathisers who wish to overthrow the new regime are still plentiful. There he tries to uncover a dangerous plot and investigates the death of a small child found floating in the River Meekong. 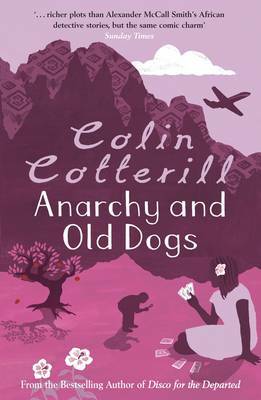 The real strengths of Colin Cotterill’s Dr Siri series are the colourful set of characters, the light and witty prose, and a wonderfully rich sense of place and history. Through the narrative he engages with weighty matters such as nationalism, socialism and familial relationships, without them dominating the story in some overloaded ideological manner. They’re a delight to read. Anarchy and Old Dogs is the fourth book in the series. Whilst the plot was interesting, I felt that it unfolded in a relatively straightforward manner, lacked some twists and turns, and the mystical elements used to good effect in the other stories was underplayed. There was also a sense that the book was doing a lot of work for the next book in the series, moving new characters and scenarios into place. As a result, it felt like a transition book, rather than having a fully rounded story of its own. For me, that meant it was an enjoyable read, but one that didn’t quite fulfil its promise. Regardless, it and the whole Dr Siri series is well worth checking out as no doubt is Cotterill's new series, the first book of which has just been published. A superior series in so many respects. Compassionate, weird, eccentric in the extreme, and very funny. I still think the bizarre dream sequence in CURSE OF THE POGO STICK where Dr. Siri makes a surreal trip to a bureaucratic hell peopled with officious demons is one of the most original and funniest scenes. I eagerly loko forward to a new Colin Cotterril book every year. 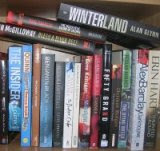 In fact, his new book - with the new series character - is waiting to be read as I type this. I agree, this is a really fine series. There are so good I "save" them to read at peak times.